about this book: These two short cozy mystery stories follow Los Angeles newspaper reporter Rebecca Stone after her first adventure in the cozy mystery novel CAST THE FIRST STONE. In the first story Rebecca is asked by a friend to figure out whether the friend can safely date a man rumored to have murdered his wife. In the second story Rebecca is on the set of a film being shot on the Universal lot when an "accidental" death occurs. As in CASE THE FIRST STONE, this ebook includes recipes from the Jewish holiday book SEASONS FOR CELEBRATION, written by Rabbi Karen L. Fox and myself. I have lived in Los Angeles for over 30 years and continue to be intrigued by the film business. The second short story, while quite short, is a peek into that world. Rebecca's newspaper beat at the imaginary daily newspaper the Los Angeles World is business/finance. I draw on my M.B.A. in Finance from The Wharton School to help me write about the stories she covers. 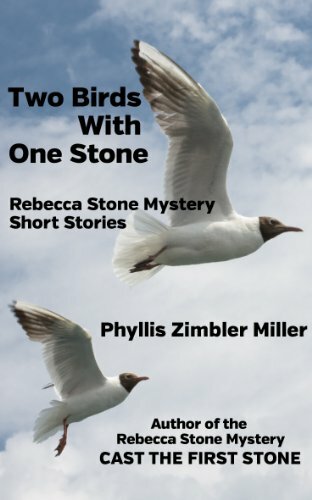 I have written other cozy mystery novels about Rebecca Stone and I look forward to publishing these soon.